Today is the birthday of Henry James Pye, who “was an English poet, and Poet Laureate from 1790 until his death” in 1813. In one of his works, entitled “The sportsman’s dictionary: or, The gentleman’s companion: for town and country.” and his version was based on an earlier anthology work which he “Improved and Enlarged” and published in 1807. 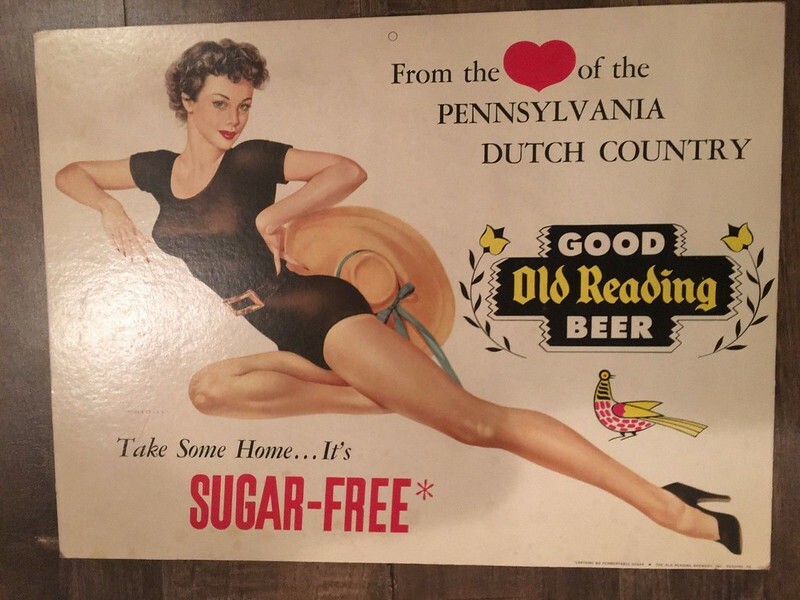 Under the entry for “Glanders” — an infectious disease primarily in horses — something was prescribed called “Chalybeate Beer” that included directions for how to make it. From what I can tell, “Chalybeate waters, also known as ferruginous waters, are mineral spring waters containing salts of iron.” They were apparently thought to be good for you and “in the 17th century, chalybeate water was said to have health-giving properties and many people have promoted its qualities.” Water from the springs was bottles and sold as medicine. Chalybeate springs were located throughout Europe, though especially in England, Scotland Wales, and there were at least seventeen prominent springs in the United States. 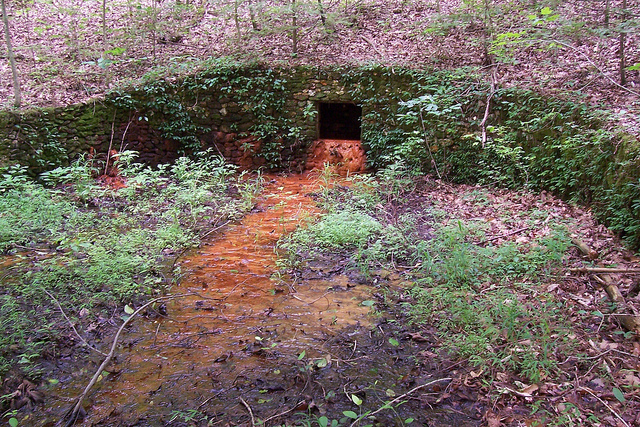 A chalybeate spring, identifiable because of how the iron turns the color of the water. 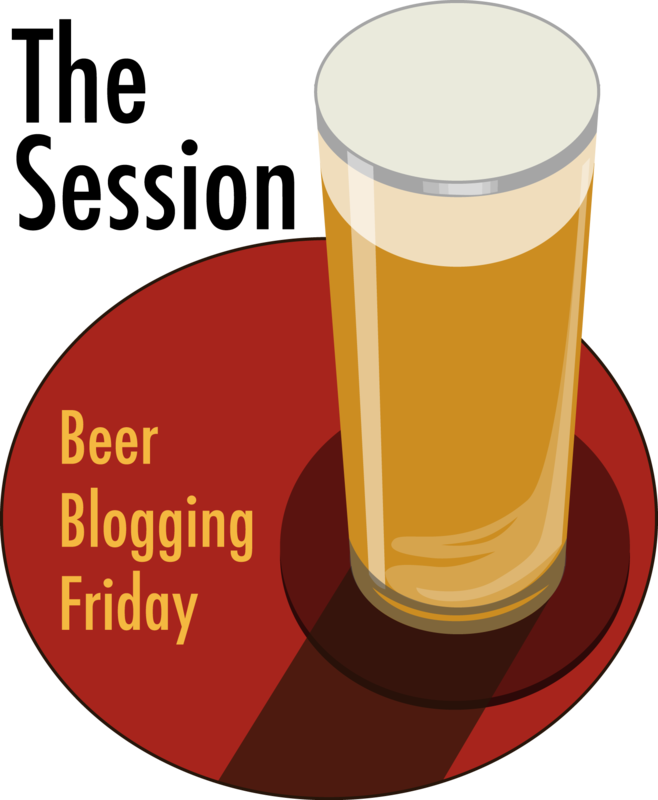 A Chalybeate Beer, may be made as follows: Steel filings, sixteen ounces; cinnamon and mace, each two ounces; gentian-root bruised, four ounces, anniseeds bruised, three ounces. Infuse in one gallon, fine, clear, old, strong beer for a month, stopped close, shaking often, then strain. Give half a pint for s dose, in a pint of cold water, once or twice a day, upon an empty stomach, leaving the horse an hour or two to his repose. I have taken this from the Vinum Chalybeatum of Boerhaave, substituting old beer, which I have reason to believe a good menstruum for the steel, instead of Rhenish wine; and adding one of the best bitters. Should cinnamon and mace be thought too expensive, Jamaica pepper, or allspice, would be a cheap and proper substitute. It was the opinion of that great man, that no drug, diet, or regimen, could equal the preparations of iron, for promoting that power in the animal body by which blood is made; of course, it must be a powerful specific, in all cases of over-relaxed solids, debilitation and consumption. 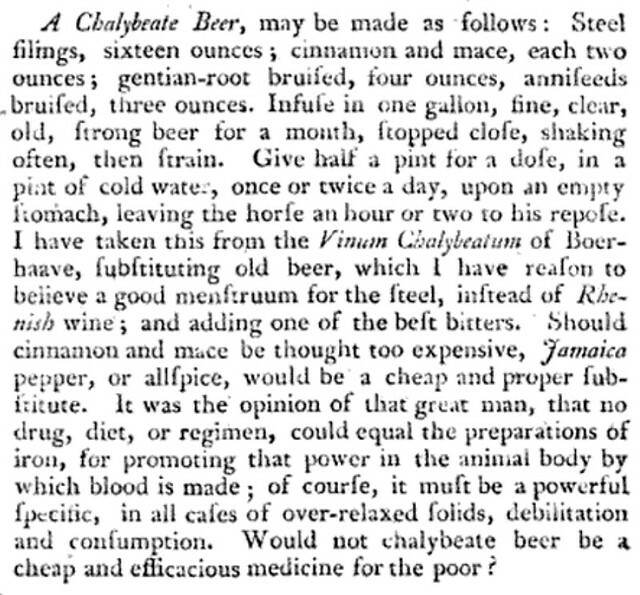 Would not chalybeate beer be a cheap and efficacious medicine for the poor? Now doesn’t that sound tasty? 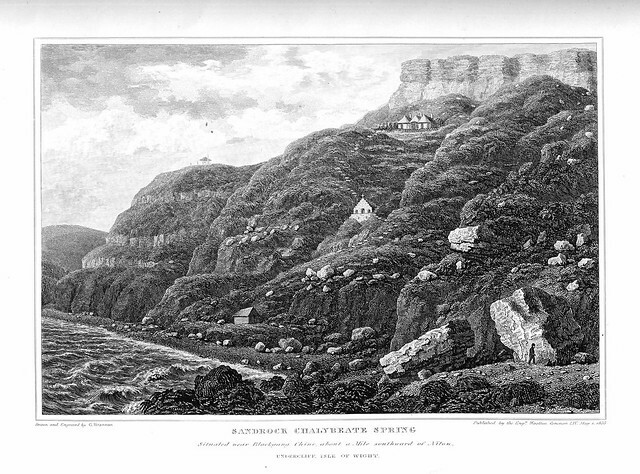 The Sandrock Spring, looking towards Blackgang Chine, located on the Isle of Wight. The 19th and early 20th century is filled with accounts of quacks and patent medicines sold by snake oil salesman. All sorts of wild claims were made and almost without exception they were complete bunkum. 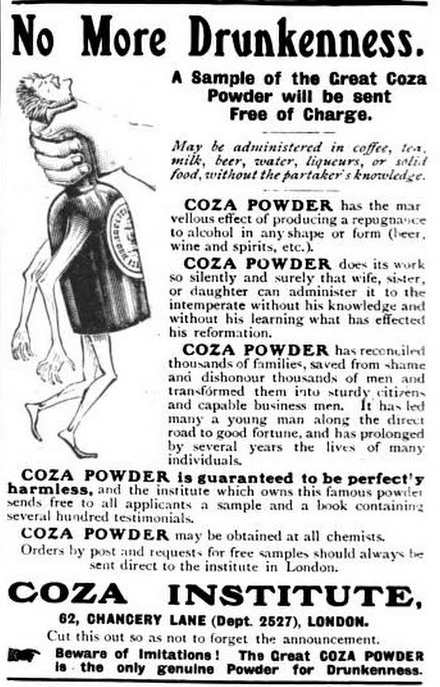 I just came upon one I hadn’t seen before, something called Coza Powder, from the Coza Institute in London, England. Here’s the ad, from “The Strand Magazine,” published in 1907. I also found examples of the same ad as late as 1909, and even a couple in Spanish, so it appears to have been sold worldwide. Not surprisingly, the BMJ found that Coza powder was nothing more than bicarbonate of soda, cumin, and cinnamon. And essentially it’s 90% sodium bicarbonate and the remaining 10% is equal parts cumin and cinnamon. They put the cost — in 1909 — at 1/30th of a penny for 30 packages of the powder. 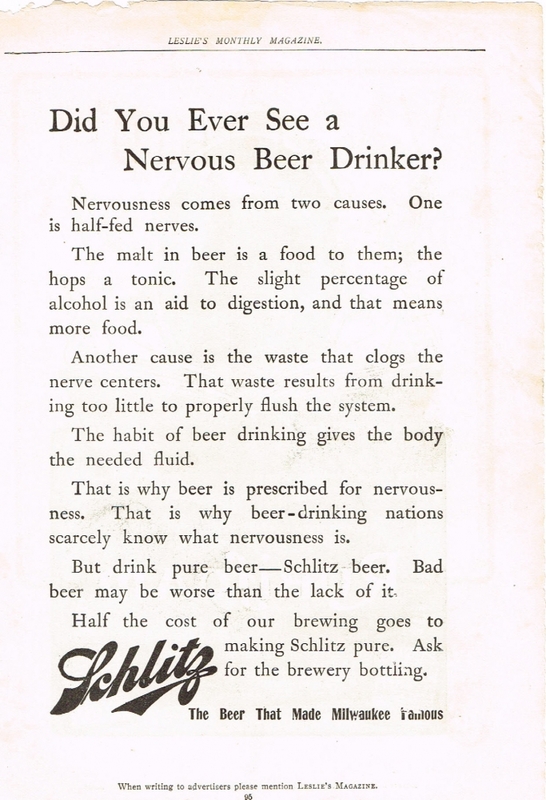 Beer In Ads #2247: Do You Ever See A Nervous Beer Drinker? 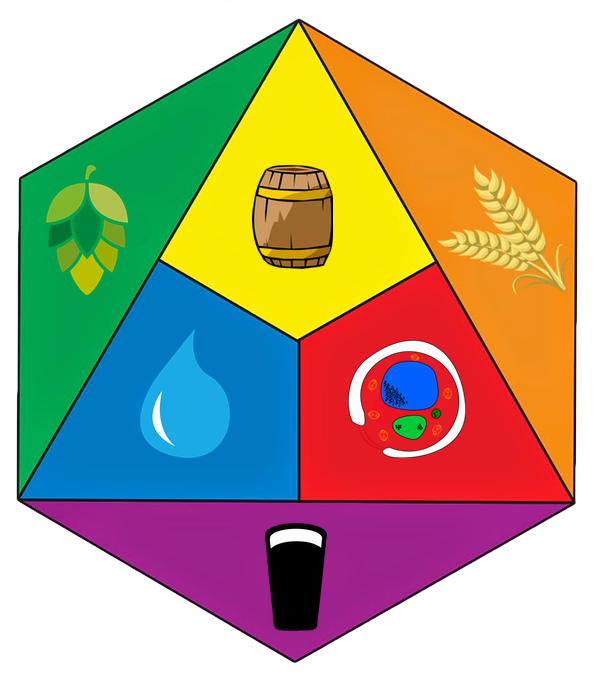 A beer composition includes water, ground malt, yeast of bottom fermentation, hop extract and milk thistle solution in the following proportion: 100 l water; 10-50 kg ground malt; 1.0-3.0 l yeast of bottom fermentation; 10-30 g of alpha acid of hops extract; 5-30 g milk thistle solution for 1 l of wort. 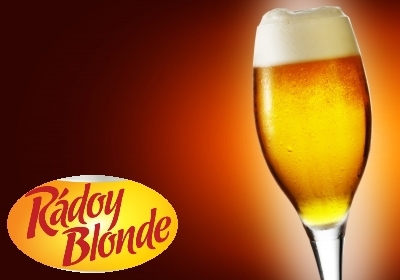 A production method includes mash preparation, mash saccharification, wort separation from the spent grains, wort boiling, fermentation, and after-fermentation. At the beginning of wort boiling the milk thistle is added, whose fruits were ground in a grinder with a roller distance of 0-2.5 mm, the grinding is mixed with water, heated to 70-150° C., and boiled for 45-90 minutes, whereupon milk thistle fruit concentration makes from 1 to 99% of wort volume. 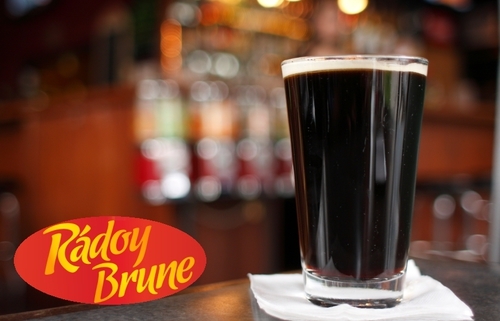 The beer composition enables not only a positive effect on a human body, especially on a liver and kidneys, but also having curative properties. 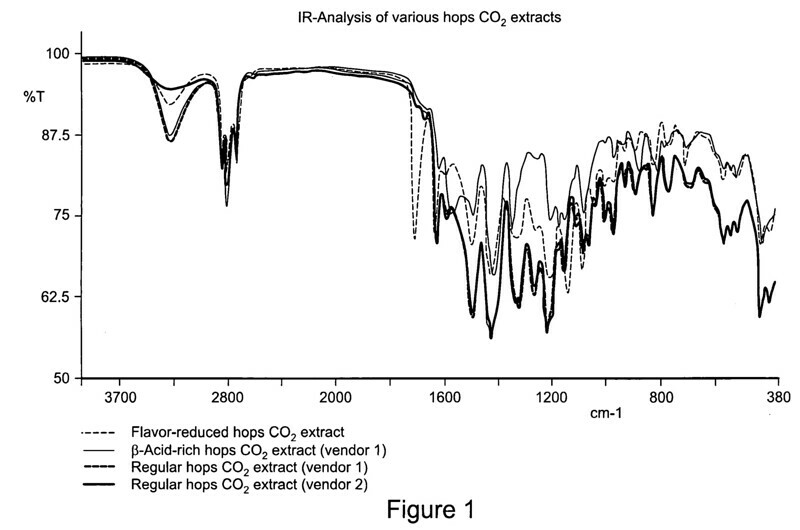 The present invention relates to deodorants and other body care products comprising a CO2 extract of the hops plant having bacteriocide/bacteriostat properties wherein the CO2 extract has a very low level of essential hops oils. 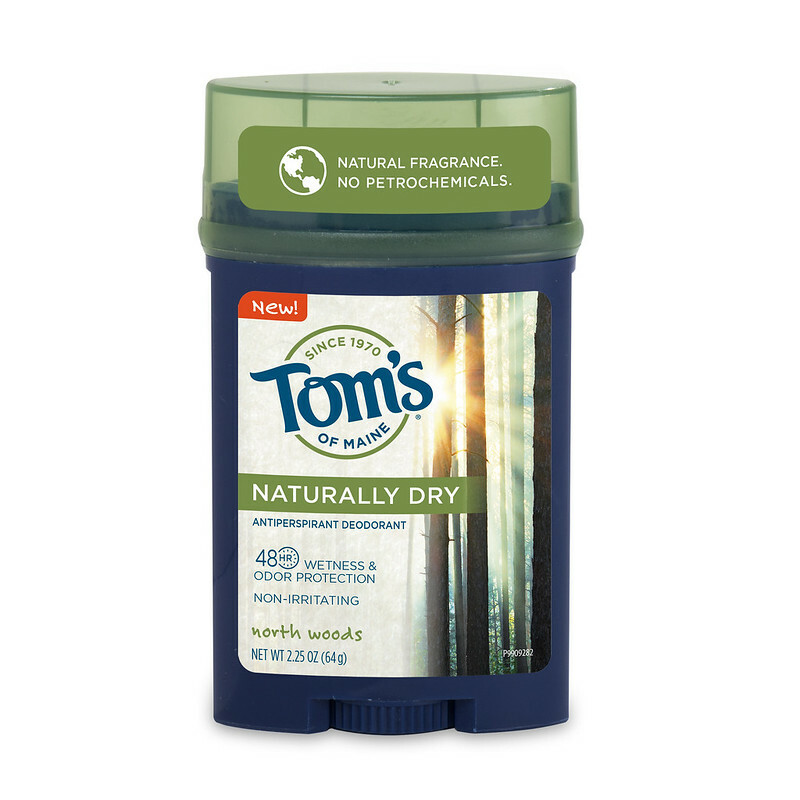 So some deodorants today do list hops as an ingredient, such as the Tom’s of Maine line, all of which list Hops extract [CO2] and caprylic/capric triglyceride as one of the ingredients. The hop plant is a perennial herb that grows in vines. 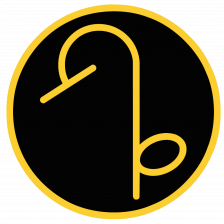 Native to Europe, Western Asia, and North America, it is known for the speed and persistence of its growth. Most people are familiar with hops because of its role in beer-making, although it also featured in ancient kitchens and the medical recipes of herbalists. First widely used in beer by monks in 9th- and 10th-century Germany, the hop didn’t gain popularity because of its flavor. 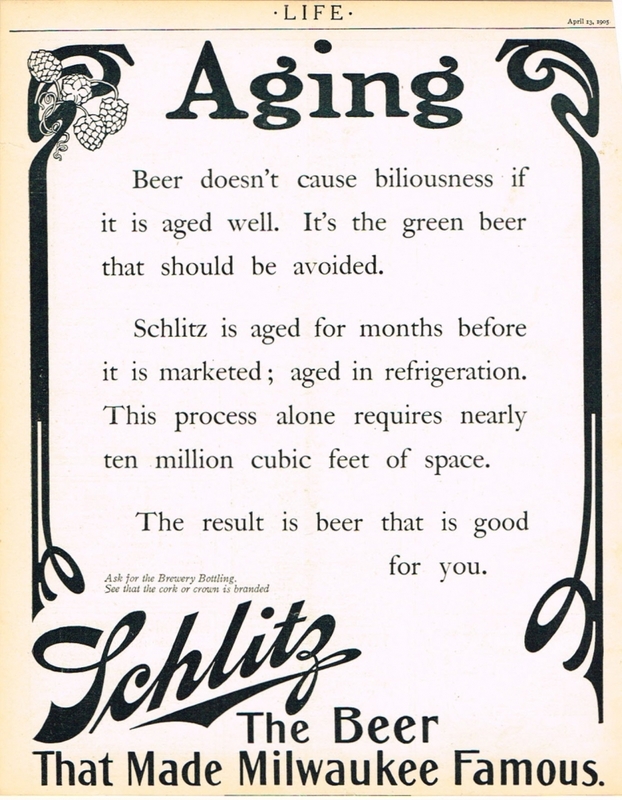 Instead, the “bitter principles” of hops exhibit antimicrobial behavior, making the ingredient an effective preservative and stabilizer. 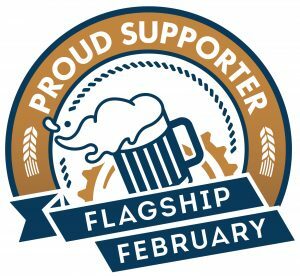 In 1516, Wilhelm IV, lord of Bayern, ordered that hops be one of the required ingredients in beer in his Reinheitsgebot (Purity Law). 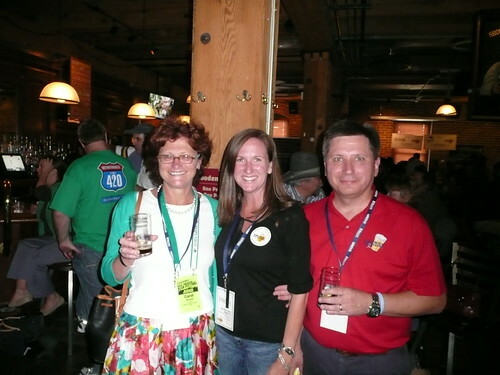 That law led to similar enactments in other countries and helped to standardize the use of hops in brewing. 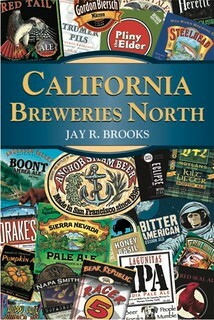 Hops’ distinctive bitterness has now become one of the familiar attributes of a typical beer. Only the female flowers, known as cones, are used in beer-making. For our deodorants, we use hop resins extracted from the cones. Unpleasant odor is caused by skin bacteria when we sweat. The “bitter principles” that help hops to preserve beer also, it turns out, fight odor. Hops inhibits the growth of bacteria in our deodorant by causing leakage in the bacterial cell membrane, which impairs bacterial function and therefore prevents odor. We use hops in all but our Long-Lasting Roll-On Deodorants. Lichen (Usnea barbata) has been in our (and many other natural) deodorants since 1991, and it provided effective and natural odor protection. However, a minor percentage of the general population—often, those who tend to have fragrance allergies—may experience a skin reaction to lichen. Even though it’s a relatively uncommon reaction, we weren’t satisfied, and our scientists continued to search for ingredients with less irritancy potential. We also felt increasingly uncomfortable with the environmental drawbacks to using lichen. Studies have shown that the large-scale harvesting of lichen may not be sustainable given its long regeneration rates. Hops are believed to have sedative properties, but topical application in the amount found in our deodorant will not cause sleepiness. Tom’s of Maine recognizes that no two people are alike, and even with pure and natural ingredients, some individuals may develop an allergic reaction that is unique to them. As with any product, be sure to discontinue use if you experience discomfort or other indications that the product may not be appropriate for your individual body chemistry. This seems similar to another patent Owades was granted in 1981, Patent No. 1112183A1: Humulus Lupulus (Hops) Extract As Sunscreen Agent. That patent appears to have expired in 1998, and I’m not sure if his sunscreen was ever available commercially. This one’s more of a skin treatment, and I did find one that claims to use hop extracts, Balancing Oil Free Skin Conditioning Serum. While it doesn’t say so on the product’s main page, on another one, Benefits of Hops in Natural Skin Care, in which they state that “Lily Farm Fresh Skin Care utilizes the benefits of hops in Balancing Oil Free Skin Conditioning Serum. This multi-tasking product is for people who both do not want oil in a moisturizer and people and who are struggling with blemishes and wrinkles. They need a cure for both with one product. Balancing Oil Free Skin Conditioning Serum conditions and firms the skin while also healing and moisturizing.” So maybe that’s it, hard to say. 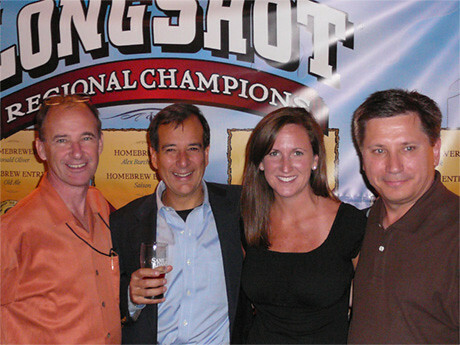 This is most likely the origin of the hangover prevention that Jim Koch, from the Boston Beer Co., has popularized over the years, but especially after Esquire magazine ran an article about it last April, How to Drink All Night Without Getting Drunk. 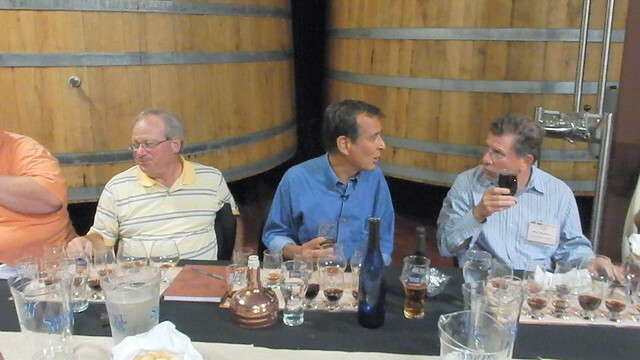 The story got picked up by NPR, Serious Eats and even Snopes took a look at it. 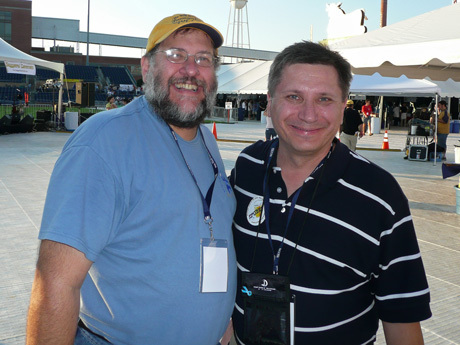 But I’d actually heard Jim tell the story a couple of times at various events, most recently at a beer dinner last year at the Jamaica Plain brewery in Boston celebrating the 30th anniversary of Samuel Adams. 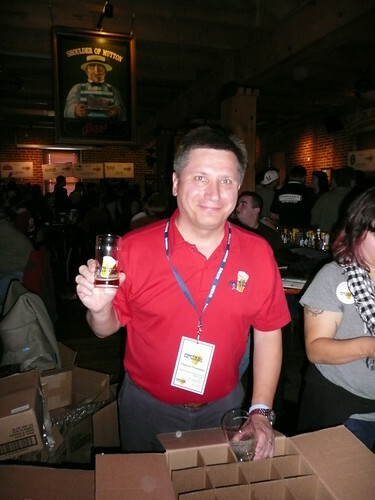 In telling the story, Jim did, of course, mention that the idea came from Joe Owades, who had worked as a consultant with the Boston Beer Co. since the very beginning, and off and on thereafter. But I don’t think I’d realized before now that Joe had actually patented the idea.